The Yaktrax Walker is designed for people who are looking for an easy-to-use, lightweight traction device for their shoes. The Walker is the original version of Yaktrax and is ideal for pedestrians, the elderly, business people or anyone who want greater stability on ice and snow. 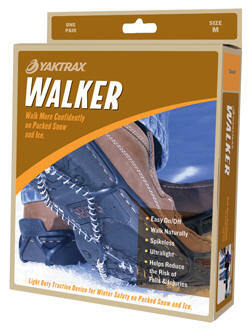 Use the Yaktrax Walker while walking to and from work, school or just to the mailbox. The Walker is made out of an injection molded thermal plastic elastomer designed for easy on and off. The coils are protected against rusting and hand-wound to give you 360 degrees of traction on ice and snow. When you walk in the Yaktrax Walker, every step you take places hundreds of biting edges in direct contact with the ice beneath your feet. Yaktrax can be worn in temperatures as low as -41 degrees farenheit. The patented design of the Walker makes it a unique solution to walking on packed snow and ice. The outerband conforms to the length and width of your boot or shoe. The high strength horizontal coils provide forward and backward stability. The vertical coil pattern provide side-to-side stability.